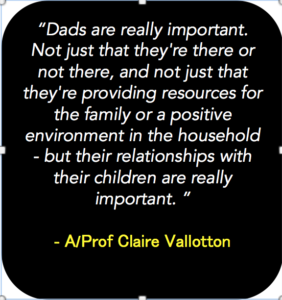 In this Psychology Report, I talk with Associate Professor Claire Vallotton from the Department of Human Development and Family Studies and Michigan State University in the USA, about father’s parenting stress and its relationship to cognitive and language development in toddlers. This interview is based on the findings of this paper, and you can listen to the podcast as well as reading our conversation below. SJ: In this transcript of the second show of Season 1 of “Who cares? What’s the point?” , I talked with Associate Professor Claire Vallotton at Michigan State University. In this conversation we talk about the effects of fathers’ parenting stress on children’s language and cognitive development – which is unusual in a few ways. Firstly, because we know quite a bit about mothers’ parenting stress but less so about fathers and, secondly, we know quite a lot about the effects of fathering on behavioural outcomes – normally negative behavioural outcomes – but less about language and cognitive development outcomes. So, I started off by asking Claire about what inspired her to look at fathering from this particular angle. CV: Well, I’ve been doing research on parenting for many years and most of it is focused on moms and there’s a couple reasons for that. One is our societal assumptions that moms are primary caregiver and therefore their interactions with children in their parenting matters the most; and you know the science of parenting is really built in the science of of moms parenting. And then it’s also, as a researcher, it’s a lot easier to get moms into a study that is dads. Part of that is just who you can find at a school or a childcare centre dropping their kids off, who responds to our invitations and ads. Also, even when dads are the ones you come in contact with a school or a childcare centre they’ll often say, “Oh, I have to ask my wife first.” So it’s often times just easier to get moms into studies but that really ignores the potential contributions of dads and means that we have a big gap with understanding fatherhood and fathers’ parenting, especially when it comes to parent-child interactions. So I guess that I’ve done research on parenting for years and and largely focused on moms for those same reasons, some assumptions and some just because it was who we could get. But then we really started looking at wanting to get a whole picture – we’ve got a whole family system here, let’s get a bigger picture of what influences children’s development and wanting to look into dads, their influences on children’s development and and what it is about dads parenting that might be similar or different from moms. SJ: You’re talking about access and interest and getting access to fathers interested in this. The other thing you were talking about in this paper was really focusing on the cognitive and language aspects of that relationship, because I think that a lot of the previous research that has been done with this – with these fathers – has been focused on behavioural difficulties. So what led you down the road of looking at cognitive and language development? CV: Part of it is really not wanting to take a deficit model that previous research you mentioned – so much of it is focused on what happens when dad’s not there and really fatherhood looked at as a simplistic matter of presence or absence, or how much time does dad spend. We wanted something that looked more at the quality and recognised that and dads are going to have an influence on things other than behaviour and that social domain. We we didn’t know what to expect though because of that. There’s a literature showing some stuff about dads and influencing kids behavioural development. But we we went in with fewer expectations with respect to the influences they might have on their cognitive and language skills, just kind of not knowing if it was gonna be similar or different from moms and how is that going to to play out. We also didn’t know whether dads would have similar effects on their boys and girls. There’s a little bit of literature showing that moms’ parenting has a bigger effect on boys and that boys are more vulnerable to environmental influences of many many kinds, including the social environment – their parents and parenting interactions. So we suspected maybe dads would have a bigger influence on their boys that on their girls, not so much because it’s the same gender but because boys are often more influenceable than girls are in early development. We weren’t quite sure what we would see when we started studying but wanted a bigger picture and something to show the real influence across different domains that dads could have on their children. Most of my studies are on early childhood – it’s a time of super rapid development across domains and so we wanted something also would focus on early development and there’s such critical things going on there with cognition, language, and social and emotional skills – all of those. SJ: So, you have a track record in looking at this and working in this field, and what I’m hearing from you is that you are looking to take a little bit of a different stance or posture away from this deficits model and thinking about what fathers actually contribute positively to this relationship and this development pathway. So, are you also saying that the literature gave a little bit of guidance, but you weren’t really sure what you’re going to find I wonder? Tell me what was it like doing this research looking at this question which hadn’t been looked at in any great kind of detail before? CV: One of the things we have to figure out as we’re approaching this is, is it fair, is it right to look at fathers the way the same way as we look at mothers? The field has a history of not looking at fathers in the same way, like I mentioned, just kind of presence/absence – this deficit model – but when we wanted to look at the things that might influence dads parenting and ultimately their children’s development we had to ask, is it going be the same things? Can we use the same surveys? Can we use the same paradigms to look at dads parenting as we do when we look at moms parenting? So, we’re trying to figure this out and we debated using a number of different types of measures. The data set that we used – we used an existing data set that we have access to and where we we know the people who designed the original study and collected the data, but there was many ways we could have approached it. We could have said, let’s just look at see what aspects of fathering makes a difference and just done something from the ground up. Ultimately, we decided we would look at something that has been established … the Parenting Stress Index. It was a measure created for mothers, and if you look at the questions you can maybe debate to what degree they were really focused on moms. It doesn’t doesn’t refer to mom specifically on but it was a measure created for moms – and so we’re asking ourselves is it is this really legitimate to to ask fathers these same questions and to use the same survey that we do with moms to measure dads’ parenting stress and their influences on kids. Ultimately, we decided it was a good place to start. Maybe there would be a better way to do it but it was a good place to start, and that if we found that the same things matter for dads as they do for moms we could at least then legitimately compare it to moms and then go from there. So, I think right now there’s a continuing debate around how to adequately capture the important aspects of fathers and fathering, so we went with the sort of more traditional route – use the same measure that we use with moms – but there’s probably other routes we could have taken. SJ: That Parenting Stress Inventory: when was that developed? CV: You know, I don’t know for sure. I know it’s it’s been around for quite a while and it hasn’t changed much. I imagine overall it could probably use a little updating but it’s very widely used – at least in research on moms and starting to be more used on research on dads too. I think its at least three decades old, so we would expect that the language needs a little updating and probably some of the items too. But, if you have you read the items carefully they seem things that seem to stand the test of time about the kinds of things you enjoy about parenting, as well as the ways that it can be stressful and the things that might be particularly stressful about about your particular child. SJ: Yes, it would be interesting wouldn’t it to see how applicable that was across time, and also how parenting roles have changed quite a lot and expectations of fathers and mothers and expectations of sharing work and sharing parenting – how all of that has changed. And how the stresses of what may not have changed as well, but may be distributed differently across these different parents. So briefly, can you summarise your findings on how parenting stress of fathers is linked to cognitive and language development and how the child’s gender plays into this. CV: We approach those two questions about the child’s language and the child’s cognitive development with the same basic approach, but we answer them as separate questions on. We wanted to make sure that we are counting for the effects of moms in there because, of course, these children have two parents – they have moms and dads, and we know that moms and dads stresses and lives are very associated with one another. So we wanted to control for the effect of moms’ stress and also for both parents some sort of demographic risk factors, income and family stressors. We accounted for both of those things in the model so that we could really just tease apart the effects the dad stresses might play on the children’s development. With cognition we look to see if dad stresses when children were two-years old were going to have an effect on children’s cognitive development and skills when they were three-years old, when you account for moms’ stress, family risks, and children’s development of cognition at two years. So, we’re really looking at dads effects on change on growth and development from two to three years old in children’s cognitive skills. And we look to see whether there is the same effects for boys and girls and there were. So, dads with higher stress when their kids were two have children with lower cognitive skills at three years old and vice versa – dads that had lower parenting stress, which means things are going more smoothly in their relationship with their spouse and with their child and they’re feeling good about the role as a father, then their children’s cognitive development was higher at age three. When we go to language skills, we ran the same analyses and we found similar results, with dads’ stress at two-years old affecting the three-year-old outcomes – but here we found the gender difference so that dad’s effects were bigger on boys than they were on girls. SJ: So that’s really interesting – you found that the effect of fathers’ stress has over and above the impact of mothers’ stress as related to parenting – that there is no difference upon differences in cognitive development (in terms of gender of the child) but there was in language development a year later according to whether the child was a boy or a girl. So, why is this important? How does this change our understanding of fathers’ stress in relationship to their child’s development in that critical to two-to-three-year-old period? CV: Well, it really adds to the small but growing evidence that dads are really important. Not just that they’re there or not there, and not just that they’re providing resources for the family or a positive environment in the household – but their relationships with their children are really important. The degree to which they can focus on their kids, that their stress is not getting so much in the way of their interactions, they can really be present and enjoy their children, and the role of parenting. It matters for kids’ development and I think we knew that about moms – we didn’t know that about dads. We didn’t know that that the way that dads feel about their parenting – relating to this Parenting Stress Index – really does affect their children’s development. It’s very likely that that has some more proximal influences, for example, in the specific ways dad’s interact with their kids, or the amount of time they spend with them – I’m sure those are all things that we could pursue in the future – but for now, we know that how dad’s feel about their parenting and about their relationships with their kids is critical for kids development. I think that’s the new thing in the broadest sense. What’s also new is the language piece – the gender differences in language. It’s a finding we probably want to replicate in other studies and to really dig into and see what it’s about. But it might point to some different ways that dads interact with their boys than they do with the girls and we’d really like to find that out. But for now, we know that boys are more influenceable in their language development as well as social-emotional (development) at an early age and therefore dads have potentially a bigger influence. SJ: Can you talk a little bit about the implication of that difference between boys and girls. and the explanation for that. Say perhaps how boys and girls may show different facets of language skills according to how they’re assessed possibly? CV: Right. So, let’s talk about that the difference between the between boys and girls first and the implications next. Very early in development, girls tend to be a little bit ahead of boys – just on average – and across different domains and includes definitely the social and emotional domain as well as the language and communication domain. A little bit in cognitive, but it really shows up more in the social and communication (areas). Very early on – especially in toddlerhood when this study was done – girls are showing just on average an advantage over boys. Those skills that girls have a little earlier really causes them to interact with adults and other children in different ways than boys, so can engage more, they can express their ideas a little bit more clearly. It’s really what explains a lot of the gender difference in self-regulation and behavior problems at an early age, as girls have advanced communication skills. So, already you have a difference there between boys and girls and so when you add in here – now we’ve got parents interacting with children, but the children are a little bit different themselves – it maybe the girls’ language is already advanced at this young age beyond the point of being more influenced. So, it could be that boys, just by having a few months lower language development, they’re just more open to influence at this age by their dads or anyone else than the girls are. Or it could say something more about what the boys need in terms of their stimulation for their language – that would be something we would have to investigate to find out what it might be. Boys and girls are also different in their social skills that comes out in differences in their communication, so by toddlerhood, girls are already listening and in their social interaction are a little bit more aware of what’s going on socially around them – so that too could explain a little bit of the difference where the girls might be buffered a little bit already. SJ: So that’s interesting, the theory that boys are not yet beyond that critical development period, whereas girls perhaps are less influenceable because they have gone beyond that period and perhaps a little bit further. So Claire, what do you think the future implications are for this work? Who should care about this research? CV: Well, first I think, parents. I think both moms and dads should care to know that dads are really important and at the time they spend with their kids and the quality of the time that they spend with their young children is important. I’ve often heard dads say, “well, you know, i’ll spend more time or I’ll get more involved when, you know, when my kid can talk, when my kid can play with me outside,” or even worse for dads who are not living with their children you know when the child is 18 we can have a relationship. But dads matter really early and they matter a lot and so I think parents should care and and moms should encourage dads to be engaged with their kids, rather than acting as gatekeepers potentially. Next I think, an interventionist should care – so when you’re thinking about designing a way to support young children’s development more holistically, they should reach out and make sure that dads know they’re important and that they engage dads intentionally and specifically in addition to moms. SJ: Yes, because often it can be thought that dads matter in terms of getting access to material resource, but also in terms that dads can not exactly absent themselves, but perhaps think along the lines of well mums there they can take care of all of that language stuff and I’ll get involved when the child is older. But what you seem to be telling us is that their is an influence starting at a very early age here, that it happens the other way around to – that when the fathers are happy and experience less stress and they can have more positive interactions, that also seems to have an impact on development too. CV: Absolutely – that has a really positive impact on kids development. Even the most caring dads, you know, they’re asking themselves how can I best support my child? And this answer that society gives them is often, well go earn more money, or make sure that you have a good relationship with your spouse – and both of those things are really good for kids. But we shouldn’t minimise that dads have a direct influence on the kids development and can be really positive in that way too. I would say that dads need support to be the best as they can. You know, a lot of resources and intervention programs are are geared towards supporting moms to be great parents and I think dads need support as well. I think they should have access to the kinds of parenting supports that are available. So, parenting supports should be available to both moms and dads and we can’t expect either moms or dads to be able to figure it out on their own. The post Quality of relationships matter for fathers and their children’s development appeared first on Sarb Johal.